Back in Stock supports integrating with the beautiful Mobilia, Responsive, and Retina themes from Out of the Sandbox. This guide will explain how the integration works and walk you through installing it for your store. 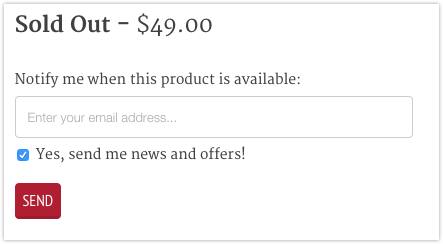 One of the great features of these themes is the Notify Me form built into the product page. By default it will send the store owner an email, but by installing an integration you can have the email address sent to Back in Stock. Back in Stock integration also works great with the quick view popups and mobile support. Your store will need to have one of the following themes installed for this feature to work. If you have an older version the built-in notify me form isn’t included, so the integration won’t work. You can either upgrade your theme or continue to use the standard Back In Stock product page widget. This is the most important step. In the next step Back in Stock will install a new template snippet into your theme, and backup your current snippet. While this shouldn’t cause any problems it’s very important you keep a backup of your theme just in case something does go wrong. Log into Back in Stock and choose Customize, then Theme integration. Check the Mobilia, Responsive, Retina, or Parallax theme is selected in the dropdown, and select Install to selected theme. 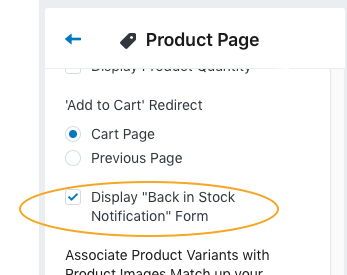 Find an out of stock product in your store and try out the notification form. TIP: If you are logged into a customer account the email field won't appear (your customer account email address will be used automatically). If you can see the form but the email field is missing you are probably just logged into a customer account. If everything is working well with the form you can disable default widget button. In the app choose Customize, then Product page button. In the Appearance tab uncheck Widget button is visible on product pages. Hit Save button settings.